Ângela Ferreira’s artistic endeavour has a powerful ideological dimension, resulting from the artist’s thorough analysis and reflection of the effects that colonialism and post-colonialism have had on contemporary society. Through frequent use of architectural elements and structures, her work produces ambiguous formal and spatial relationships, and is therefore located in a liminal area between Russian Constructivist ideologies (due to the correlation between abstract, geometric shapes and political ideas) and the re-appropriation of significant episodes of her own personal, social and local experience. Ferreira’s sculptural practice is the starting point leading to installations which combine other, non sculptural media, such as videos, drawings, photographs and written texts, to make each piece more poignant and meaningful. 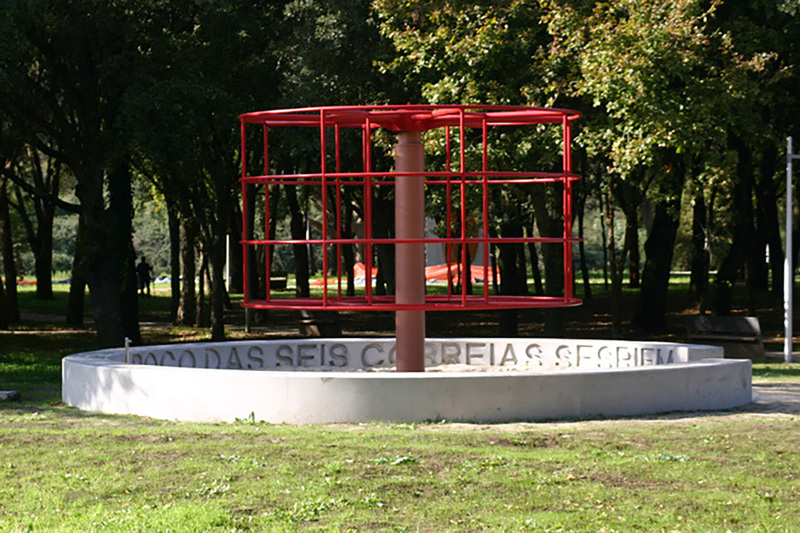 Sesriem – poço das seis correias [Sesriem – the six-strap well] is a site-specific piece for the Rabada Park, aimed at giving continuity to two important aspects of Ferreira’s artistic discourse: on the one hand, the construction of outdoor public artworks intended, first and foremost, to be functional and useful; and, on the other hand, the ongoing discussion of issues that call into question the relationship between Europe and Africa. Whereas the first aspect has its obvious realisation in the playground-like quality of the sculpture, the second one requires further contextualisation. A recurring strategy in some of Ferreira’s recent work has been the appropriation of structures (whether architectural or other) found in certain African locations, and their “importation” into Europe. As a whole, this is an attempt at counterbalancing the sequence of events in European history, as they have been persistently exported to Africa. In the case of this project, the artist chose a natural referent: the Sesriem camping site in Namibia’s Namib desert. This camping site is a unique spot created around a well with such deep water table that, so the story goes, it was necessary to tie six horse reins together in order to draw water. Today, Sesriem is a small park in the middle of the desert, containing eighteen camping plots. Living conditions are so harsh there that each plot can give shelter to only one “family” of campers. Every plot provides its temporary dwellers with a small round patch of land enclosed by a low wall and containing a big central tree and a water tap. Being in the middle of the desert, the survival of the tree depends on how often the tap is used, allowing for the water to drip into the soil and feed the tree, which provides much needed shade. A small natural ecosystem is thus created, ensuring the campers’ survival. Therefore, Sesriem is intended to celebrate the memory of that place in Namibia by bringing it close to us through a complete set of references. Standing for the crown of the central tree, rocked by the wind, the modernistic metal structure may be used by children as a spinning climbing frame. Bearing the piece’s title, the wall encircling the camping plot has been reproduced, and may sit those accompanying the children. The circle within the wall has been filled with sand in order to evoke the Namib Desert.